A 29-year-old Minnesota man who says he was trying to spread holiday cheer by tossing 1,000 dollar bills over an upper floor railing at the Mall of America has been cited for disorderly conduct. 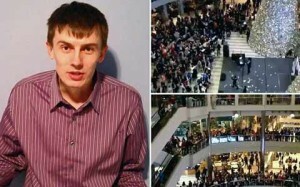 Serge Vorobyov, of Apple Valley, admitted throwing his “last $1,000” from the fourth floor on Friday as a choir performed “Let it Snow.” Vorobyov said he also kept tossing cash as he continued down the escalator. Vorobyov said he’s going through a divorce, lost his car hauling business and hoped the positivity of throwing the money would come back to him. He invited his estranged wife to try to win her back but she didn’t show up, he said. “I wanted to do some sort of pay it forward kind of thing,” Vorobyov said Sunday.